I wanted to share this letter I received from our friend, George Ge, President of Humanitarian China in the hopes that you, too, will be excited and join us in shared purpose and endeavors in the coming months. The presence of Bay Area Tibetans and friends of Tibet at the 6/3 event at San Francisco's Chinatown's Portsmouth Square was appreciated and applauded by many Chinese humanitarians and democracy advocates who attended. It is exciting to celebrate this special friendship between Chinese and Tibetan people's as inspired by His Holiness the 14th Dalai Lama of Tibet. I've also shared my speech at Portsmouth Square on the Tiananmen Massacre's 25th Anniversary. 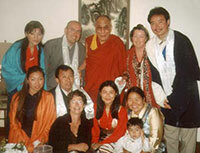 I hope it inspires you to do what you can do help freedom, democracy, and justice along in China and occupied-Tibet. We highly appreciate your speech on June 3rd, 2014 in San Francisco. A quarter century passed since June 4th, 1989, during that dark night, Chinese troops opened fire on innocent civilians and peaceful students. It was a large scale Human Rights violation. Since then, Human Rights situation in China has become worse and worse. Thus, we need to work together, not only to commemorate those lost their life, but also to protest Chinese government's ugly behavior. Safeguarding Human Rights in China is the goal of Humanitarian China. We share this common purpose. On behalf of Humanitarian China, I send this appreciation letter. Thank you for showing solidarity with us. Thank you for all coming here today and for the invitation to speak. On behalf of the Bay Area Friends of Tibet, I express solidarity with the Chinese people on this 25th anniversary of the June 4 massacre in Beijing. We mourn for all those who died and pray for those who died for freedom, democracy and human rights. Please let me offer this prayer for the people of China and Tibet. The Chinese government claim that their PLA army soldiers became the guardians of the public, and the military crackdown was justified as one that was necessary for stability and prosperity and that the student uprisings was also against a Western conspiracy to divide and weaken China," there is a sense that China is being victimized by the West." They use the same lies to justify their occupation of Tibet. So Tibetans are used to the upside down claims of the government. The students involved in the Tiananmen Square movement were neither anti-communist nor anti-socialist. Their speaking out in defense of the Chinese people's constitutional rights, in favor of democracy, and taking a stand against corruption, truly conformed to the underlying beliefs of the Chinese Communist government. This was confidently stated by the then Party chief Zhao Ziyang. Today we stand in solidarity with the popular demand for the government to be more accountable to its people, less corruption, for the freedom of the press, for freedom of speech, and four the restoration of workers' control over industry. Today, we honor our fore-fathers and mothers and their vision, courage, and determination. We must never forget the Chinese people defiantly-enduring. Today is to honor China and the sacrifices made in 1989 by our elders and community and recommit ourselves to take any steps, leave no stone unturned in search of peace and justice. We bow our heads and pay respects to these and all our 6/4 martyrs and all the human rights victims of the Chinese Communist Party, offer thanks and tribute to all these Chinese. We pray for genuine social, religious, political, and cultural freedoms and a China that honors everyone human rights highly and equally. We stand in solidarity and pray for the Tiananmen Mothers and call for the Chinese government to heed their demands. 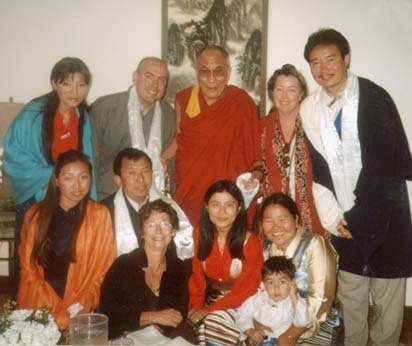 We are not called to sacrifice as extraordinarily as our 6/4 heroes, but to do our own many small parts for peace, to perform numerous ordinary acts of peace for China with great love and never forget, to work incessantly to free the Tibetan and Chinese people, and remove a terrible blight on the world’s conscience and bring China back as a respectable partner on the world stage. Thankfully we are not dead like some of our heroes. We are not cowards. We feel the pain of our elders and still resist the corruption of government leaders. We must protect the blessings that are meant for us all to enjoy life, liberty and the genuine pursuit of their happiness. On June 4 We Remember, memorialize and we Press On! We Show we Remember and we Carry On! We Always Remember and keep Going! With remembrance in hearts and vision, courage and determination we will make a Free Tibet and a Free China. As His Holiness the Dalai Lama, said, Never Give Up! June 4 means we keep the Dream of liberty, equality and justice for all, Alive. Free Tibet & Free China! Again, please help and join us!